As part of the Bournemouth Emerging Arts Fringe, Gerauschhersteller Experimental Music Ensemble are putting on a performance of Cornelius Cardew’s legendary graphic score piece, ‘Treatise’. This is one of the best known graphical musical scores – 193 pages of lines, symbols, and abstract shapes. 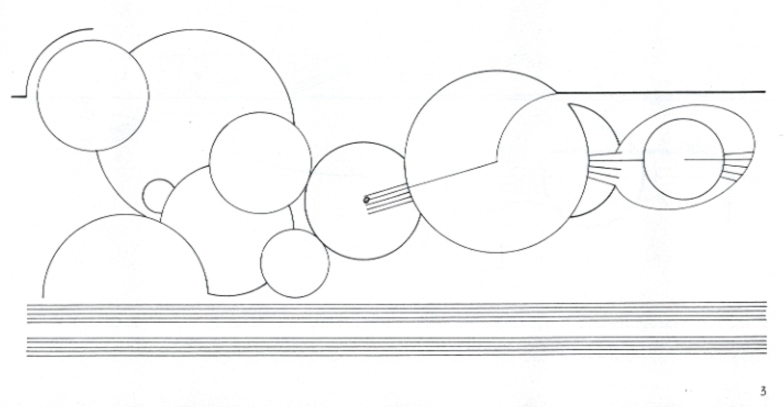 Cardew’s score is also a work of visual art in its own right. Each performance is unique, as the performers need to agree the rules and approaches they will use to interpret the score. This performance will be given by the Gerauschhersteller Experimental Music Ensemble, and will be accompanied by video projection of the score itself. The date is Thursday 29th October, 7.30 pm, in the Hilda Coles Open Learning Centre, which is behind the Priest House Museum, High Street, Wimborne. Tickets £5 (£3 concs.) on the door. This entry was posted in associate artist, music, partnerships, video. Bookmark the permalink.